The hidden world of of the Security and Surveillance Industrial complex has attracted the attention of big media in US. The most complete and updated source of information on this is the Washington Post special investigation website Top Secret America where maps , interactive features and and updated articles explore the hidden business of Security in America. The Department of Defence is the authority in charge to oversee those companies but it has declared recently that is overwhelmed by the amount of private companies to control and is unable to keep an eye on all their activities. According to Democracy Now over 1/3 of USA surveillance and enforcement operations are conducted by private contractors, the surveillance grid established by the National Security Agency intercepts every 24 hours over 1.7 billion personal communications in US only. E-mails, phone calls, SMS, internet postings all are recorded and disseminated to a wide range of private and public agencies for analysis. Data is not provided only to big names as Raytheon, Booz Allen Hamilton, L-3 Communications, Csc, Northrop Grumman, General Dynamics, Blackwater, Saic, but also to a myriad of small and medium businesses which represents 70% of the industry, most of them employ less than 100 employee and are in charge of background checks, fiscal checks, phone and internet wiretapping and data analysis. It is not only the National Security Agency or police and other governmental agencies contracting their services, more and more private companies such as corporation, banks are contracting their services for employee checks and other intelligence purposes. Ho safe we are that public data is not being used for private interests? We are unable to say it at this stage given the lack of supervision and tracking of the information. Should Europe have followed Iceland in letting go bust their banks to avoid a sovereign crisis and impoverish the population to cover banks' bad debt? The U.S. and Europe have thwarted white collar fraud investigations ... let alone prosecutions. On the other hand, Iceland has prosecuted the fraudster bank heads and their former prime minister, and their economy is recovering nicely because trust is being restored in the financial system. Spanish banks lost €1 out of every €20 deposited with them in July, making it the worst month for deposit flight in 15 years as rumours grew that the country is edging closer to a full bailout. News that banks were losing deposits came as Spain's statistics institute revealed the current recession is worse than thought, with the economy shrinking at an annual rate of 1.3% in the second quarter. A collapse in internal consumption in a country squeezed by government austerity and massive unemployment is largely to blame for the recession, as this fell at an annual rate of 3.9% in the second quarter. Unemployment is already at 25% but the speed at which jobs are being destroyed quickened to an average rate of 800,000 jobs a year in the second quarter, according to the statistics institute. Paulo Oliveira and his wife sold their wedding rings to pay the rent after he lost his job as a builder last month. They were the couple’s last pieces of jewelry. Portugal’s gold exports increased by more than five times to 519.4 million euros last year from 102.1 million euros in 2009, according to data published on the Lisbon-based National Statistics Institute’s website. Times are now so tough that Valerio Novelli, a ticket inspector on Rome’s buses, is planning to sell his old gold teeth. “I can’t get to the end of the month without running up debts,” said Mr. Novelli, 56. People are barely surviving based on the gold passed down from generation to generation. The pawnbrokers, by contrast, can hardly keep up with business. They normally have the gold quickly melted down and sent abroad, making it one of Italy’s fastest growing exports. Official gold sales to Switzerland leaped 65 per cent last year to 120 tonnes, up from 73 tonnes in 2010 and 64 tonnes in 2009. That’s not just gold being exported, that is wealth being exported! Brent crude jumped to $115 a barrel last week and petrol costs across much of Europe are now at record levels. Diesel is above the political pain threshold of $4 a gallon in the US, hence reports circulating last week that the International Energy Agency (IEA) is preparing to release strategic reserves. Barclays Capital expects a “monster” effect this quarter as the crude market tightens by 2.4m barrels a day (bpd), with little extra supply in sight. Goldman Sachs said the industry is chronically incapable of meeting global needs. “It is only a matter of time before inventories and OPEC spare capacity become effectively exhausted, requiring higher oil prices to restrain demand,” said its oil guru David Greely. A further risk to oil production has materialized with Tropical Storm Isaac which now looks set to threaten New Orleans and the Gulf. Weather trackers are predicting an increase in intensity given its size and the storm's predicted paths are set to cross straight through the middle of the Gulf's oil production in a replay of the terrible August of Katrina. All major rig operators are evacuating which leaves output notably down already. 24% of oil and 8,2% of natural gas output has been shut down for tropical storm Isaac and markets will be monitoring the situation closely tomorrow. During Katrina prices rose by 75c and given tight reserves at this moment the situation could get even worst. Velocity of money is the frequency with which a unit of money is spent on new goods and services. It is a far better indicator of economic activity than GDP, consumer prices, the stock market, or sales. In a healthy economy, the same dollar is collected as payment and subsequently spent many times over. In a depression, the velocity of money goes catatonic. Velocity of money is calculated by simply dividing GDP by a given money supply. The following is the velocity of money since Great Depression, sometimes a picture is worth more than thousand words and the picture is quite clear here. The situation here is worst than the Great Depression and World War II and deteriorating fast. If we look across the larger and longer established Euro membership we can see these two patterns being replicated according to country type. Each country shows the cumulative real disposable household income growth for each of its income deciles. The lowest income decile is to the left of each country’s selection, and the highest to the right. Austria looks to be alarmingly weak – what this actually represents is very little change in nominal disposable income growth, coupled with inflation. Germany, Ireland, most of Italy and the French middle class all experience a decline in their standards of living. In most of these countries, the highest income groups do relatively well. What stand out are Greece, Portugal and Spain. These economies have benefited from increased standards of living under the Euro (at least, until 2010), as nominal incomes have overcome inflation pressures. There has also been a concentration on improving the lot of the lower income groups in these societies. This chart unfortunately plays into the hands of the more nationally minded politicians of the Euro core. The argument can be made (and increasingly is being made) that periphery economies must simply accept the declines in living standards that their non-periphery counterparts have had to accept. Lower living standards in the sense of real disposable income implies either lower wages, or yet more fiscal austerity, or both. Another great infograph on the USA Presidential Campaign! Italy's Debt Growth going ballistic! The fact Italy as reached 1.97 trillion Euro debt is by itself scary but what strikes most in the following chart is the pace of growth that has accelerated tremendously. Pre-Euro (1999), Italy's debt was growing at a rate of just less than 2 Billion Euro per month. After the Euro (2001 until the crisis in 2008), Italy's pace of debt growth almost doubled to 3.8 Billion Euro per month. Since 2008, Italy's debt load has grown at a stunning pace of 6.4 Billion Euro per month. In the last nine-months though the pace of debt-load growth surged to 9.5 billion Euro per month. Der Spiegel has published an article about Europe's 10 Most Dangerous Politicians although some of those names are certainly interesting choices up to you to decide if more worthy names deserve to be in this list. Let me know what you think! Since 2010, when China pledged over $100 billion to develop commercial projects in Africa, the continent is rapidly being harvested by China for resources. Map below show China's interests in Africa since 2010. If the recent quarrel between Italy and Germany is a clear signal that political divisions are growing in the dysfunctional Euro family, the graphs below from Goldman Sachs clearly illustrate how the economic divide is already there and widening by the day. I have highlighted some parts of the report which sound an alarm bell for the month to come. Bottom line: A ‘red line’ has descended across Europe, running along the Pyrenees and the Alps. Banks south of this line have difficulty accessing Euro interbank markets, whereas banks north of that line remain better integrated and retain market access. As Mr. Draghi emphasised at last week’s ECB press conference, this segmentation is interfering with monetary policy transmission and thus affecting macroeconomic outcomes. Monitoring the intensity and geographical location of the ‘red line’ will remain crucial going forward, not least to assess the effectiveness of the policy measures announced by the ECB last week. “… financial fragmentation hinders the effective working of monetary policy”. Mr. Draghi’s comments at last week’s ECB press conference have placed the segmentation of Euro financial markets at centre stage. In this daily, we explore the nature of that fragmentation, focusing on the Euro interbank markets. From hot to cold: The periphery is being frozen out. Charts 1 and 2 show the row country’s bank claims on the column country’s banks, in 2008 Q1 and 2012 Q1 respectively. The numbers capture these claims expressed as a percentage of the column country’s (quarterly) GDP in 2008 Q1. Of course, representing the data in this form is not a neutral choice. But the basic insights revealed are not sensitive to our choice of scaling variable. The charts are presented in the form of heat maps: ‘hot’ colours (red) reflect a high degree of financial interaction, whereas ‘cold’ colours (blue) point to financial isolation. In 2008 Q1 before the failure of Lehman, integration of Euro interbank markets was high: i.e. Chart 1 is predominantly red. With the notable exception of Greece, banks in all Euro area countries have significant claims on all other Euro area countries. Ireland, Spain and Italy are all well-embedded into the Euro interbank markets. In 2012 Q1 as the European sovereign crisis has intensified, integration has broken down: i.e. Chart 2 is predominantly blue. In particular, the three programme countries (Greece, Portugal and Ireland) have become isolated. Spain (and to a lesser extent Italy) are also drifting towards greater isolation, whereas among Germany, France and the Netherlands integration remains significant, albeit still diminishing. A ‘red line’ has emerged in Euro interbank markets – and is shifting northwards. To draw on the credit rationing literature in economics, banks in the periphery have been “red-lined”, i.e. simply on account of their residency, they are being excluded from the Euro interbank markets. This red line has long isolated the program countries. And it is now moving northwards: Italy and (especially) Spain are vulnerable. A ‘red line’ running along the Pyrenees and Alps cleaves the big-4 countries at the heart of the Euro area in two. Given the deep recessions being suffered in Spain and Italy, the implications for borrowers and the real economy – as well as for the ability of monetary policy to ease tight financing conditions – are self-evident. There are people who can quickly memorize lists of thousands of numbers, the order of all the cards in a deck (or ten! ), and much more. Science writer Joshua Foer describes the technique -- called the memory palace -- and shows off its most remarkable feature: anyone can learn how to use it. Avi Rubin explains how hackers are compromising cars, smartphones and medical devices, and warns us about the dangers of an increasingly hack-able world. One of the fastest growing businesses in the world is Beer! In 2011, it rose by another 60 million hectoliters to 1.9 billion hectoliters, and was 38.3% higher than in 2000, according to the annual beer and hops report by Barth-Haas Group. Although in this case as well growth is being fuelled by emerging economies. In most developed countries, production dropped. In the US, it edged down 1.6% last year and 5.7% since 1990—despite a significant increase in the population. In Germany, it stabilized recently, but had plunged 20.5% since 1990. Production in the UK had skidded 27.5% during that time, though it ticked up last year. In Japan, production is down 14.7% since 1990, and down 3.6% from 2010, the seventh straight year of declines. But the rest of Asia is on a binge mission. Well, except India, the only major country that hasn’t yet discovered a taste for beer. The driver in worldwide beer production growth was China, up 9.3% in 2011, and up an astonishing 600% since 1990. Of the 60 million hectoliters in growth worldwide last year, 42 million where brewed in China. Vietnam made huge strides; in percentage terms a 2,680% melt-up since 1990. Beer production also grew in Africa and Latin America. Russia is a special case: in the Soviet Union in 1990, beer production was zero. By 1996, Russian beers and Heineken were available, but hard to find in smaller towns or on trains, though vodka (served in water glasses or by the bottle) was everywhere. Since then, Russia has shot up to third place in beer production, knocking off Germany and other countries. Today, the Czech Republic and Austria are the top two beer-drinking nations in the world with 143 and 108 liters per capita respectively. In 2011, 51.8% of the world’s beer was produced by six mega-brewing groups. In June, ABInBev announced that it would acquire 7th ranked Grupo Modelo, giving the company a 21.5% share of the worldwide market. Without further acquisitions, the top six will brew 54.7% of all beer in 2012. Germany still has about 1,250 breweries, four times as many as the rest of the EU combined. They range from brewpubs to mega breweries. About half of them are in Bavaria. And there are almost 5,000 brands. "September will undoubtedly be the crunch time," one senior euro zone policymaker said. "In nearly 20 years of dealing with EU issues, I've never known a state of affairs like we are in now," one euro zone diplomat said this week. "It really is a very, very difficult fix and it's far from certain that we'll be able to find the right way out of it." As eurocrats take their mandatory vacations for a job well done, Europe will enter hibernation mode, until September which according to Reuters "is shaping up as a "make-or-break" month as policymakers run desperately short of options to save the common currency." But Greece is, once again, just the beginning. Sept. 12 is a crucial date in the European diary. On that day the German Constitutional Court is scheduled to rule on whether a treaty establishing the euro zone's permanent bailout fund, the 500 billion euro European Stability Mechanism (ESM), is compatible with the German constitution. All this, and much more, is finally coming to a head, as the time for can kicking is running out. 14 August: Euro area Q2 GDP flash estimate, from Eurostat. Mid-August: French Constitutional Court/Fiscal Compact. In Mid-August the French Constitutional Court is due to rule whether the Fiscal Compact, which euro area countries are due to endorse by the start of 2013, needs to be ratified into the French Constitution. If so, a joint vote by the French Assembly would be required. Signals are that this would happen in September if required. See accompanying article on France in this issue of Focus Europe. 20 August: Greek bond redemption. Greece is due to repay EUR3.1bn of GGBs. Following the PSI, these would be GGBs owned by the ECB and EIB. While agreement on how to reconfigure the second loan programme is unlikely before September, it is unlikely the EU will hold-out from paying funds to Greece to repay the ECB/EIB. In a consolidated sense, the official sector’s exposure to Greece remains the same, but the creditor changes (to the EFSF). Alternatively, Greece could issue T-bills and the Greek banks could absorb them with the assistance of ELA from the Greek central bank. End-August: DBRS rating on Spain/Ireland. By the end of August, the DBRS ratings agency is due to have concluded its review of Spanish and Irish sovereign ratings. September: Moody’s due to conclude review of Spanish sovereign rating. Logically Moody's should wait until there is clarity on direct recap before making a decision on Spain’s rating. Since governments have not made progress fleshing out a direct recapitalisation facility — indeed, have created some ambiguity as to whether it will be non-recourse — there is a distinct risk that Moody's, in another move to be “ahead of the curve”, decides to downgrade Spain within the next 3 months. Moody’s currently rates Spain Baa3, the lowest investment grade rating. September: Detailed bottom-up Spanish bank stress tests due for publication. 6 September: ECB Governing Council meeting. If we are right about the outcome of the 2 August ECB meeting (dominated by “quantity” measures), we suspect that revisions to staff forecasts for growth and inflation are likely to be a basis for a 25bp rate cut. 12 September: German Constitutional Court ESM ruling. The German Constitutional Court is to rule on the complaints lodged against the ESM and fiscal compact. The chances of the ESM being vetoed are low. However, the Court might again strengthen the German Parliament’s prerogatives as regards future European integration (see Focus Germany, 20 July). Germany is the last approval needed for the ESM to come into effect. Then the first instalment of the capital has to be paid by the ESM members within 15 days of the ESM treaty entering into force. There are three other countries where Constitutional Court queries are outstanding — France, Austria and Ireland. France’s Constitutional Court will be deciding by mid-August. Neither Austria (which may take another 3-6 months) nor Ireland are large enough to hold back the ESM — the ESM will come into force when countries representing 90% of the subscribed capital have approved it. Both Germany and France have an effective veto power in that case. 12 September: Dutch Election. In April, the VVD/CDA minority government failed when Geert Wilders' PVV party withdrew its support amid negotiations for the 2013 austerity budget. A crisis was averted when three smaller parties came forward to give support to a budget, but an early election was unavoidable. Domestic austerity and European crisis issues will likely play important roles in the election. Compared to the configuration of parliament at the October 2010 election, the latest opinion polls (Maurice de Hond) show PM Rutte's VVD liberal party vying with the Socialist Party for the dominant party position. Both would gain 31 seats in the 150 seat parliament on the latest polls. This is an unchanged position for VVD, but a doubling of SP seats. SP are gaining at the expense of all other parties except VVD and neo-liberal D66. This may reflect a backlash against the austerity for 2013 which has broad party political support. SP have also taken a stance against euro rescue initiatives, voting against the ESM alongside the PVV and extracting a pledge from Dutch FinMin De Jager that parliament will vote on any future direct bank recapitalisation disbursements. Given the typical distribution of the vote among several parties, the questions are what coalition emerges from this election, how long it takes to form a government and what policies will it support? Markets in particular will be watching the ramifications for domestic fiscal policy (the 2013 Budget is a week after the election) and euro rescue initiatives. 13-14 September: G20 Finance Ministers and Central Bankers meeting. In Mexico. 14 September: ECOFIN meeting. This is very likely the finance ministers meeting when adjustments to Greece's second loan programme will be considered. The remaining EUR23bn recapitalisation of the Greek banks is due to complete by the end of September, assuming a positive review of the loan programme. This is also when finance ministers should have their first discussion on the proposals for a common bank supervisory regime under the ECB. Any delays, with knock-on delays for a direct bank recapitalisation mechanism, will disappoint the market. Options for a reconsideration of Ireland’s legacy bank bailout policies may also be discussed (decision not due until October ECOFIN meeting). Game Theory is a useful tool for analysing Europe's crisis. Bank of America dedicated a full report to a game theory scenario on the Euro Breakup, analysing the costs and benefits of a voluntary exit from the Euro-area for the core and periphery countries. The results are shocking. Italy and Ireland (not Greece) are expected to exit first (with Italy having a decent chance of an orderly exit) and while Germany is the most likely to achieve an orderly exit, it has the lowest incentive to exit the euro-zone - since growth, borrowing costs, and a weakening balance sheet would cause more pain. Ultimately, they play the game out and find out that while Germany could 'bribe' Italy to stay, they will not accept and Italy will optimally exit first - suggesting a very dark future ahead for the Eurozone. One of the most provocative observations of modern game theory is that the most likely outcome is not always the optimal one. Put differently, the dominant strategy for game players is not always to cooperate, even when everyone is better off if they do. The most famous illustration of this is the Prisoner’s Dilemma. In this game, two men are arrested. The police offer both men a similar deal. If one testifies against the other, and the other stays silent, the betrayer goes free while the one who remains silent gets a one-year sentence. If both remain silent, they will each get a one-month sentence. If both decide to testify against the other, each will get a three-month sentence. Even though both will be better off if they stay silent, the “Nash equilibrium” is that both men will testify against each other. This is because from the perspective of each prisoner, regardless of what the other person does, he can be better off by betraying. The prisoner’s dilemma problem can help us better understand the dynamics of the eurozone crisis. Below (Table 1), we present a highly abstract, stylized form of the game that Germany and Greece have been playing for the last two years. Greece is given two options: austerity or no austerity. Germany also has two options: Eurobonds or no Eurobonds. For each of the four possible outcomes a certain payoff is assigned for each country that is meant to be illustrative, but captures the essence of the different political/economic considerations of the two countries. As the payoffs in Table 1 imply, both countries would fare better if they choose to cooperate (Greece agreeing to austerity while Germany agreeing to Eurobonds) than if they do not cooperate (no austerity and no Eurobonds). However, Greece would be even better off if it chooses no austerity but Germany agrees to Eurobonds. Similarly, the best outcome for Germany is that it opts for no Eurobonds but Greece chooses austerity. We assume that neither country knows what the other country is going to do before it has to decide on a course of action. It is easy to see that the Nash equilibrium is no austerity and no Eurobonds (uncooperative equilibrium). This is because from the point of view of Greece, regardless of what Germany chooses, it will be better off if it opts for no austerity. Similarly, from the point of view of Germany, regardless of what Greece does, it will be better off if it chooses no Eurobonds. As with the Prisoner’s Dilemma, no austerity and no Eurobonds can be shown to be the Nash equilibrium even if we were to allow for the game to be played repeatedly. The fact that the dominant strategy for both countries is not to cooperate is why now more than two years into the crisis Greece is not closer to implementing a credible reform program and Germany is not any closer to agreeing to Eurobonds. The lack of an enforcement mechanism is why the Germans are demanding that fiscal union will have to precede Eurobonds. Fiscal union, by taking fiscal policy out of the hands of the national governments, solves the pre-commitment problem. However, very few eurozone countries are willing to entertain the notion of giving up their independent fiscal policy, especially given that, as members of the monetary union, they do not have recourse to an independent monetary policy. If the eurozone is no closer to a fiscal union and Eurobonds, we need to consider other potential outcomes of the crisis. Much has been said about involuntary exit from the eurozone , but what about the chances of a voluntary exit, meaning a country (or multiple countries) opting to call it quits on its (their) own accord? Even though much of the market focus on exit risk has been on Greece, Italy and Ireland have the highest relative incentive to voluntarily exit the euro, by our analysis. In the case of Italy, it faces a relatively higher chance of achieving an orderly exit and it stands to benefit significantly from competitive gains, growth gains and even balance sheet gains. No wonder former Prime Minister Berlusconi has been recently quoted as saying that leaving the euro is not a “blasphemy.” Among the peripheral countries, Spain appears to have the lowest relative incentive to leave. While Germany is the country most likely to achieve an orderly exit from the Euro, it also has the lowest incentive of any country to leave. It would suffer from lower growth, possibly higher borrowing costs, and negative balance sheet effect. Austria, Finland and Belgium don’t have strong incentive to leave, either. Incentive to leave the euro varies from country to country. Among the major economies, Italy stands the most to gain from exiting, whereas Germany has the most to lose from exiting. Germany would also lose from the exit of other countries. (Say Italy leaves the euro but Germany stays. German holdings of Italian liabilities would fall in value, German exports to Italy would suffer and German companies would now face more competitive Italian manufacturing firms.) Does this mean that Germany would be willing to pay a price for Italy (as it has for Greece, Ireland, and Portugal) to stay in the euro? The answer is Yes but would Italy accept it. Italy is clearly better off exiting than staying (after Germany has already paid the “bribe”), as the payoff for Italy in outcome 4 is inferior to the payoff in outcome 3. If we can see this, so can Germany in period 2. Whether it pays or not, Italy will exit in the following period. Therefore, Germany is better off by not paying. Now in period 1, Italy can make the informed calculation that Germany will not pay. This means that Italy has an incentive to exit in period 1. The bottom line is that the only stable equilibrium of this game is that Italy exits the euro and, more importantly, it exits already in period 1. This game and the analysis in the previous section would suggest that we should not expect what has already happened between Germany and Greece during the eurozone crisis to play out the same way for Italy if the crisis spreads. Italy has more incentives than Greece to voluntarily exit the eurozone, in our view, while it will be more expensive for Germany to keep Italy in the eurozone. This means that Italy could be even more reluctant than Greece to accept tough conditionalities for staying. Despite the depreciation of the euro in the last three years, it is still nearly 10% stronger than where it was in 2000. Against the USD, it is still 45% stronger than its low in November 2000. A much weaker Euro would significantly reduce the incentive of any country to exit. For example, a 20% depreciation of the EUR against the USD would reduce by nearly half the loss of competitiveness of Italy to the US since the inception of the Euro. If Rajoy is opening to a full scale bailout of the Spain the situation is also rapidly deteriorating at regional level, Catalonia on the wealthiest regions of Spain is facing an effective shutdown if bailot money will not be provided soon by the central Spanish government. El Pais reports Catalonia Will Not Pay Hospitals or Private Centers and 100,000 workers are affected. This month, the Government of Catalona cannot tackle payments owed to hospitals, schools, residences, social organizations, and children in care centers and workshops. These are the services provided by entities, public and private, funded by the Government. The move affects up to 7,500 associations and some 100,000 workers, according to the third sector. The news that the Government could not meet its commitments this month was confirmed on Monday after several days of negotiations with the affected entities. Sources from the Departments of Health and Welfare explained ten days ago it "could not meet the payments this month." Welfare, however, has ensured that other non-contributory pensions paid or the minimum income. The Catalan Association of Relief calculated that 63% of companies cannot meet the payroll this month. This is not the first time that the Government is obliged to defer payment. It happened last September when it could only address 65% of the amount and the rest was paid by the end of the year. Image: Artist’s conception of five potentially habitable exoplanets, with Earth and Mars to scale. 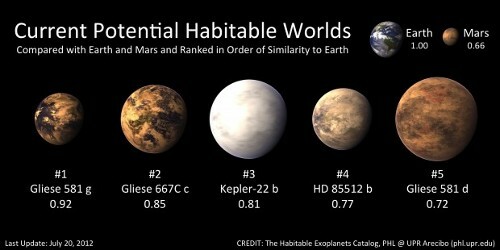 Credit: The Habitable Exoplanets Catalog, PHL @ UPR Arecibo.